Luigi Ghirri. 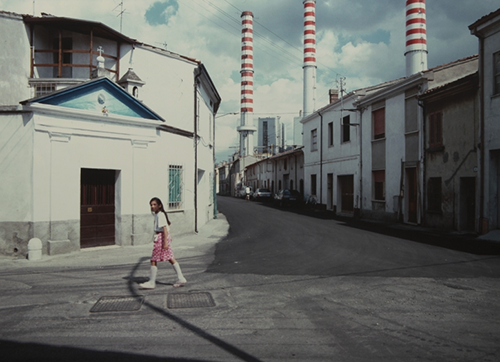 Ostiglia, Centrale Elettrica, 1987. The daily encounter with reality, the fictions, the surrogates, the ambiguous, poetic or alienating aspects, all seem to preclude any way out of the labyrinth, the walls of which are ever more illusory… to the point at which we might merge with them… The meaning that I am trying to render through my work is a verification of how it is still possible to desire and face a path of knowledge, to be able finally to distinguish the precise identity of man, things, life, from the image of man, things, and life. The contradiction between the aesthetic and the moral seemed to reach a crisis toward the end of World War II, when photographers entered the concentration camps and saw for the first time the reality of the horror that had until then not been widely visible, though certainly rumored. One British photographer, George Rodger, solved the dilemma by refusing to contaminate a sense of outrage with any aesthetic dimension. Rodger, who would become in 1947 one of the cofounders of Magnum, found himself at one point in the act of photographing a pile of corpses, "subconsciously arranging groups and bodies on the ground into artistic compositions in the viewfinder." (In fact, Rodger was not the first photographer to arrange corpses for the camera—Alexander Gardner had staged some of his most famous images as well in photographing the aftermath of Gettysburg, but it took scholars more than a hundred years to figure that out.) Rodger's realization that he was treating "this pitiful human flotsam as if it were some gigantic still-life" led to a paralyzing self-consciousness: aware of the grotesque contradiction between aesthetic requirements and his sense of moral outrage, he stopped taking pictures. Miles Orvell. After 9/11: Photography, the Destructive Sublime, and the Postmodern Archive. Michigan Quarterly Review (2006), XLV, 2. Depois de ter criado o conceito de Deus, o Criador, o homem deu por si insatisfeito. Com efeito, apesar do comprovado valor pragmático desta imagem, através da qual as artes nobres da música e da literatura, da arquitectura, da pintura e da escultura, juntamente com as artes menos nobres do homicídio, do furto e da exploração humana em geral, foram transportadas até às alturas, algo ficara ainda por concretizar: o impulso de curiosidade no homem continuava insaciado. Assim, o significado mais profundo de uma máquina, a câmara, emergiu aqui na América, o altar supremo do novo Deus. Se isto é irónico, poderá igualmente ser significativo. Com efeito, apesar do nosso aparente bem-estar, estamos, talvez mais do que quaisquer outras pessoas, a ser esmagados pelo calcanhar do novo Deus, destruídos por ele. Não simpatizamos particularmente, como Natalie Curtis assinalou recentemente em The Freeman, com a atitude algo histérica dos Futuristas em relação à máquina. Aqui na América não estamos a lutar, como talvez seja natural fazer em Itália, para nos libertarmos dos tentáculos de uma tradição medieval e nos lançarmos nos braços neurasténicos do novo Deus. Temo-lo connosco e sobre nós como uma vingança, e acabaremos por ter de fazer qualquer coisa acerca disso. Não apenas o novo Deus mas toda a Trindade têm de ser humanizados para que não nos desumanizem a nós. Estamos talvez a começar a perceber isso. Fotografia e o Novo Deus. Paul Strand, 1922.